NParks is recruiting a senior conservation officer for the Central Nature Reserves. Planning, conducting and overseeing of conservation, field research and park development and maintenance programmes. Application ends Monday, 5 September 2011. 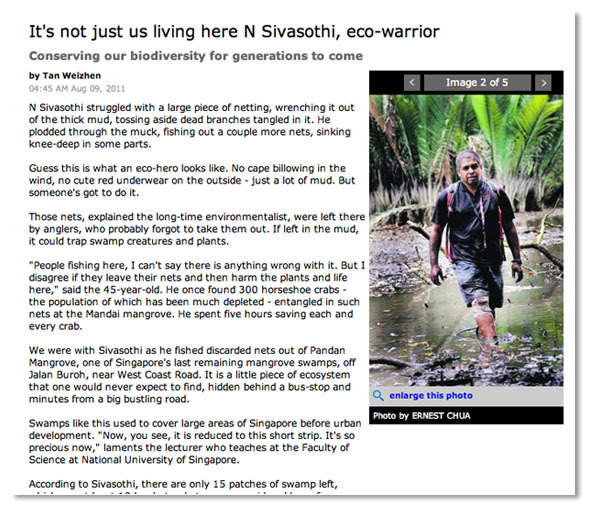 Pandan mangrove is a remnant strip mangrove in the south-west of Singapore. Trash builds up in this patch of state land because it is not part of a park so is not cleaned regularly. Thus Raffles Museum Toddycats, NUS Biodiversity Crew and Wildlife Reserve Singapore are conducting a cleanup here for the fourth year as part of the International Coastal Cleanup Singapore. 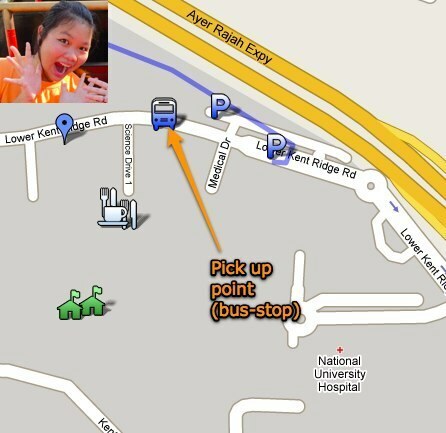 This year we are joined by volunteers from EARTHlink NTU and FMC Technologies. This cleanup is not for the faint-hearted but Raffles Museum Toddycats & the NUS Biodiversity Crew are definitely up for the task – the deeper parts of the inlet are tough and full of soft mud, with mosquitoes and some snakes! The area has no shelters or toilets and we will work rain or shine. In order to restrict numbers to reduce impact, there are only 30 places for us. 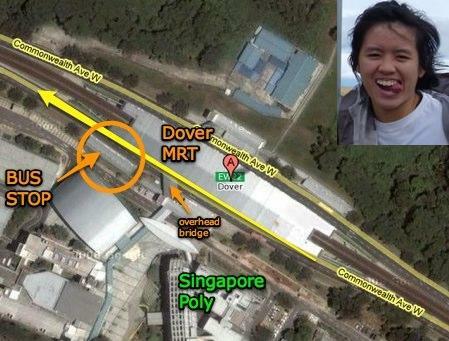 Dover MRT Station bus stop on side of Singapore Polytechnic (heading west) (7.20am; meet Meryl Teng). Two visiting Phd students who are here in NUS will be giving a talk on their respective research topics as part of the 2011 East Asia and Pacific Summer Institutes Programme (EAPSI). Alexis Figueroa, from University of New Orleans, was hosted by the Evolutionary Ecology and Conservation Lab. Together with department alumni, Anne Devan, he conducted numerous survey of our forests in search of elusive tree-dwelling reptiles. He will be speaking about Convergency, Ecomorphology and Community Structure in Arboral Snakes. Susan Tsang, from City University of New York, was hosted by the Evolutionary Biology Lab. Other than collecting bat stool for analyses, she became acquainted with the lab’s collection of cow and waterfowl dung as well. Susan’s advisor is Dr Dave Lohman, who did his postdoc stint in NUS. Her presentation will be about Phylogeography of two widespread Pteropus species (Chiroptera: Pteropodidae). 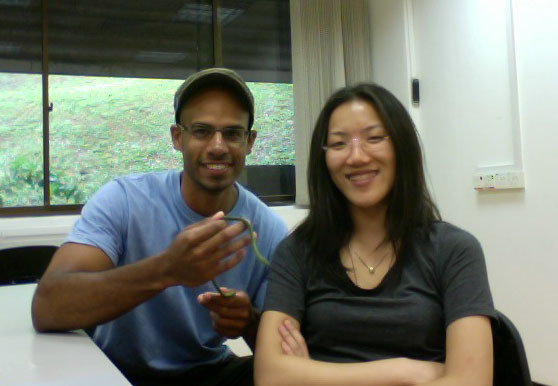 (Left to Right): Alexis, red-tailed racer (Gonyosoma oxycephalum), Susan.